We left early on a Friday morning, hoping to avoid the Los Angeles traffic. No luck. The drive to the California Central Coast is always a nice one, particularly once you get past the traffic in the San Fernando Valley. As we reached Santa Barbara, we head up over the San Marcos pass, and down into Santa Ynez. The recent fires in the hills above the valley were scorched and burned, all the way down to Lake Cachuma. We continue up the coast to San Luis Obispo, and arrived in time to grab lunch at Pluto’s, before getting to our first winery of the 4-day weekend. This was the beginning of our annual wine club trip, and the focus was on the Edna Valley and Arroyo Grande Valley. Before checking into the Best Western Royal Oak, we drove out to Edna Valley in search of some of the oldest vines in California. While the vines are actually located in Arroyo Grande Valley, the tasting room for Saucelito Canyon Wines is in Edna Valley. My intent was to try the Zinfandel from the Ditmas Vineyard at Rancho Saucelito, which were planted in 1880. They claim these are the fourth oldest vines still remaining in California. Unfortunately, there is such limited supply of the 1880 Zinfandel, it is not available for tasting. But, you can purchase it, which I did. The tasting room at Saucelito Canyon is a quaint little building off of Biddle Ranch Road, with a little Pug dog running around the tasting room. There is plenty of outside seating with views of Islay Hill. Our next stop was a specially arranged tasting with Ryan Deovlet of Deovlet Wines. I met Ryan through some other winemaker friends of mine. They told me about what he was doing, and that I had to meet him. They have never steered me wrong, and this time was no exception. Deovlet Wines has a tasting room in Templeton, but his winery is located in San Luis Obispo, and most of his fruit comes from Santa Barbara County. Ryan has been around the wine industry for a number of years, and worked with (and learned from) some of the best. While you may not have heard of Deovlet wines (yet), you have heard of the other winery he is the winemaker for: Refugio Ranch. With Deovlet Wines, Ryan is producing his own label of mainly Pinot Noir and Chardonnay, sourced from some of the best vineyards in the Sta. Rita Hills and Santa Maria Valley. He also produces a wine called Sonny Boy, and homage to his grandfather, that is a blend of Merlot and Cabernet Sauvignon. Ryan had been up since the wee hours of the morning, as harvest was in full swing, yet his enthusiasm and joy for making good wine was not exhausted. You can taste the passion in his wines, and the stories behind how he made it to where he is today were inspiring. Watch for his wines, and seek them out. Our group gathered for dinner at the Foremost Wine Company. We were seated in the wine room. The menu offered a mix of locally sourced, farm to table, items. The appetizers were very artistic in presentation, and just as tasty…particularly the fresh Burrata. Everyone in our group ordered something different for an entrée. The only negative about the menu was that the dessert descriptions did not match what was ultimately served. The wine list was fairly extensive, and the pricing was very good. On Saturday morning, we all met up for the complimentary breakfast offered by the Best Western, then gathered in the lobby to meet our driver for the day. As I normally do, I hired a tour company to take us around for the day. This year, we used Breakaway Tours. 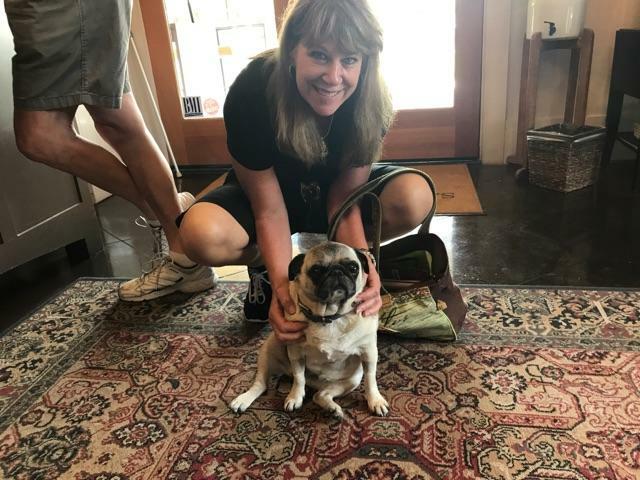 Jill Gillespie has a lot of connections in the wine region, and was able to schedule a day with the winemakers of some of the smallest wineries to one of the largest. We had four wine tasting set up for the day, along with a lunch. Our driver, Rich, arrived right on time, and we loaded up for the day. Our first stop was in Avila Beach, where we met with Cheri LaValle. She and her husband Mike Sinor own and run Sinor-LaValle. Cheri poured the wines, and began telling us how they started their winery. About a half hour in, Mike showed up and filled in the gaps with many stories about the wine industry, how they got to where they are, and his love for Burgundy. That Burgundian style of terroir driven wines, is what Mike looks for in his Pinot Noirs, Syrah, and Chardonnay Mike is another of those winemakers that also works are a larger, well known winery. He is the winemaker for Ancient Peaks (I winery I have been a fan of for years). All of the Sinor-LaValle wines are produced from grapes grown at the Bassi Vineyard, a little over a mile from the Pacific Ocean. They offer three different styles of each grape variety through their White Label, Black Label, and SLO Estate bottlings. Mike is also bottling a pétillant naturel wine (also known as “Pet Nat”) - a lightly sparkling wine, with a crown cap closure. Unfortunately, there wasn’t any available to taste at the time we were there. Oh, and if you are wondering about the design on their label….it is actually their thumbprint. We drove around Avila Beach, then headed back into the Edna Valley, and found our next winery located on a hill, overlooking the Edna Valley. Chêne Vineyards didn’t show up on any of the local information pamphlets, but picking up a 2017-2018 Visitor Brochure, you can now find them. David and Lisa Platt opened up there house, and backyard to our group, and allowed us to taste their small production wines. There was a large picnic table set up in the backyard, overlooking the Edna Valley. They produce their wines at the Center of Effort winery, which was visible from their property. The house is surrounded by 6.2 acres of Pinot Noir and Chardonnay vineyards. Both David and Lisa are pilots, but have found the time to hand harvest their grapes, and produce wines with limited intervention. They rely on natural yeasts, and organic farming. Production is only a few hundred cases. The results are a truly unique and personal tasting experience. If you visit them, make an appointment, and don’t expect to pick up your wine at their house. Our wine was boxed and delivered to our hotel by the time we returned later that afternoon. Also, check out the menagerie of animals on the property. I won’t give it away, but their daughters have some unique pets. So, we’ve been to two smaller operations. Now, we headed to the Arroyo Grande Valley, and visited one of the largest wineries in the area: Talley Vineyards. This was not my first tasting at Talley, and I’ve written about them before. 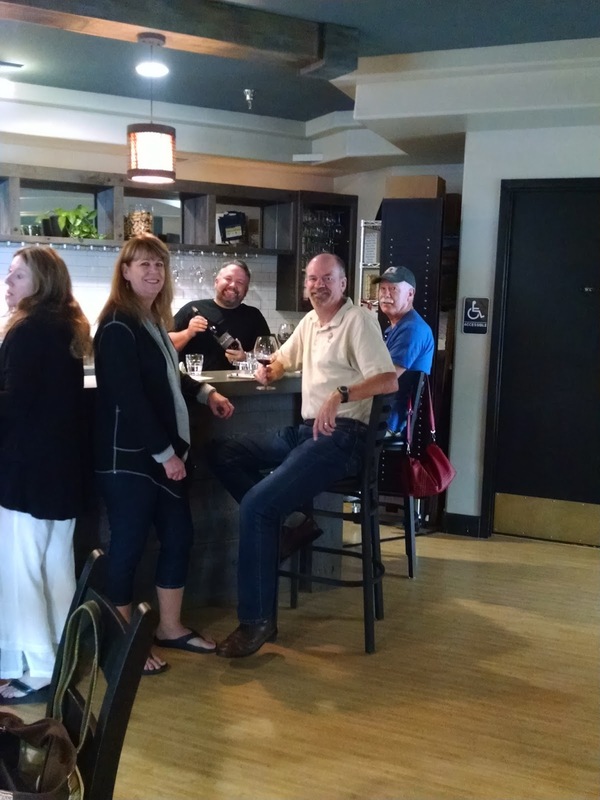 We were given a private tasting room, and went through about five or six wines. They specialize in Pinot Noir and Chardonnay, but my favorite on this visit was their Bishop’s Peak Elevation (a red Bordeaux blend). As we were leaving, we admired all the cilantro and peppers that were growing outside the building. We walked into the little farmers stand to see what was offered and ran into Brian Talley. I commented on all the cilantro and the wonderful smell in the air. Thinking that Talley had built their farming on cilantro, I was told by Brian that his father and grand-father were both allergic to cilantro, and didn’t grow it….learned something new there. Our last stop of the day took us back by the San Luis Obispo airport, and a group of warehouse buildings. We drove around a bit looking for El Lugar winery, but couldn’t find anything. 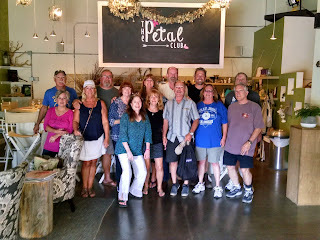 Then, we noticed a small winery sign in front of The Petal Club. It ends up that Coby Parker-Garcia conducts his wine tastings out of his wife’s floral business. She was out doing a wedding, so tasting duties and storytelling fell on Coby. My first thought was that I knew him from somewhere. After some discussion, I knew where. Coby is also the winemaker at Claiborne & Churchill Winery. We had met a few years back while tasting at their winery. El Lugar only makes Pinot Noir, including a Pinot Noir Blanc. Once again, the passion of the small producers comes through in their wine. 2013 was the first vintage for El Lugar, so this is still a small production startup. Knowing what Coby has done at Clairborne & Churchill, watch for El Lugar. 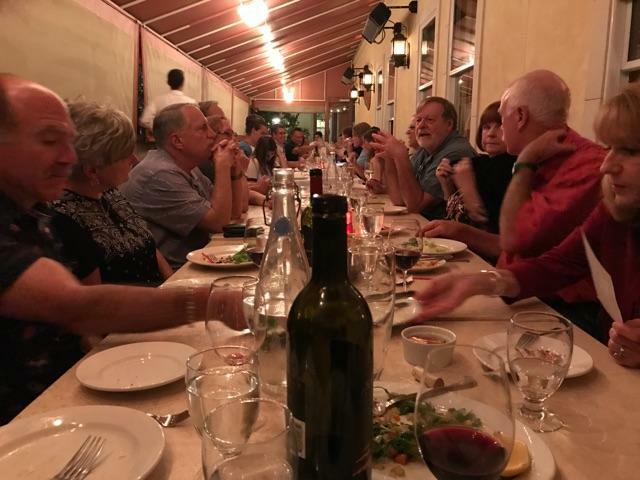 We ended Saturday with a group dinner on the patio of Café Roma, in San Luis Obispo. Handmade pastas, farm to table ingredients and a wine list full of local and Italian wines. The wine list is extensive and reasonably priced. The entrée and appetizer choices were varied and delicious. A great way to end a Saturday in the Edna Valley. Read the next blog for a continuation of a four day weekend. The snacks here had a smooth taste with a bit of cheese and lime juice. To start, we got pork rinds there; they were really flavorful with a spicy kick and smooth taste. Plus, it was a large fresh bag too, event locations are worth the price.